What are Accounts and Contacts? Great businesses are built on great customer relationships. Building those relationships takes time and care, and it also requires information. You need to know who your customers are, where to find them, how to contact them, and how you can make them happy. 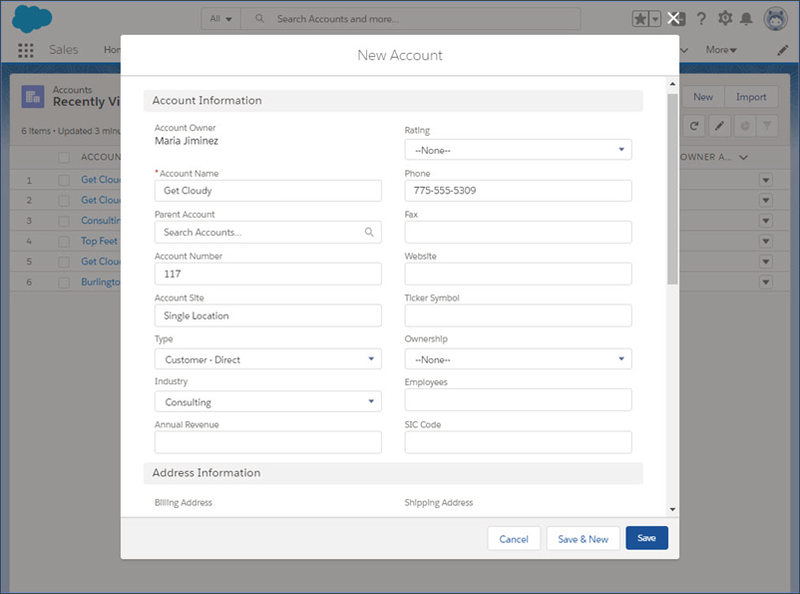 In Salesforce, you store information about your customers using accounts and contacts. Accounts are companies that you're doing business with, and contacts are the people who work for them. Accounts and contacts are related to many other standard objects, which makes them some of the most important objects in Salesforce. Understanding how to use accounts and contacts is key to getting the most out of Salesforce. If you’re doing business with a single person, like a solo contractor or an individual consumer, you use a special account type called a person account. Person accounts are similar to business accounts, but because they’re meant to record information about an individual person, person accounts don’t have their own contacts. Imagine you’re a sales rep for Cloud Kicks, a company that specializes in high-end custom sneakers. You’re on your way to a meeting with a customer, Get Cloudy Consulting. You think the Get Cloudy team will love the latest Cloud Kicks sneakers design. You need to brush up on their needs and buying history, and you want to wow them by knowing who’s who at Get Cloudy. You can find the information you need in Salesforce. In Salesforce, the companies that you’ve sold to are business accounts. We’ll refer to business accounts as just accounts from here on out, unless we need to distinguish a special feature available only to certain types of accounts. To follow along, create a Get Cloudy account in your Trailhead Playground. You don’t have to follow along to complete the challenge, but the more times you practice, the easier it’ll be to complete these tasks in the course of your regular work. Scroll to the bottom of this page, and click Launch your hands-on org. This opens your Trailhead Playground in a new tab. After you’ve logged in, click the Accounts tab (1). If you don’t see the Accounts tab, select Sales from the app picker (2). To prepare for your meeting, you can review the details about Get Cloudy, such as their location, website, people who work there, information logged about previous meetings or calls, deals in progress, and more. For example, you might discover that Get Cloudy filed a service case about two months ago. 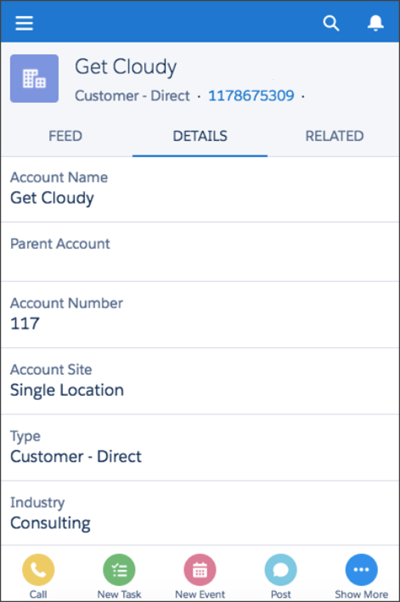 If you’re on the road without your computer, you can view most of the same account information using the Salesforce mobile app. In the Salesforce mobile app, tap Account, search for Get Cloudy, and tap Get Cloudy. To follow along, create contacts for Alan and Leung in your Trailhead Playground. You should still have the Get Cloudy account open in your Trailhead Playground, but if not, click the Accounts tab, then click Get Cloudy. Scroll down to Contacts, and click New. Add a contact record for Alan Johnson. Add a contact record for Leung Chen. 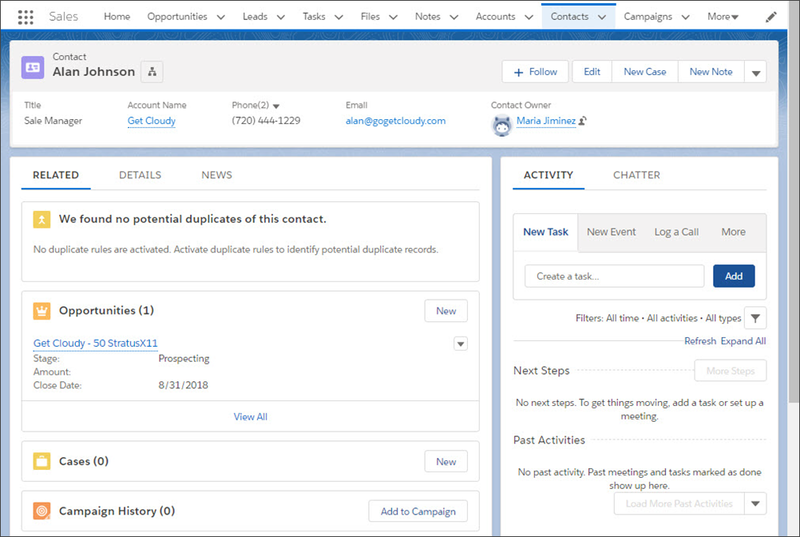 Now that Alan and Leung have records in Salesforce, you’d find them by clicking the Contacts tab and locating them in the Recent Contacts list. And because both Alan and Leung are contacts for the account Get Cloudy, you’d find them both listed below that account’s record details. Click Leung or Alan’s name to view the full contact record. Salesforce records are only as useful as the information you store in them. It’s great to store contact information, phone numbers, and names. It’s even better to keep a running record of your interactions so that you know exactly when you last worked with a customer, what you talked about, and what you have scheduled. The related information listed for each contact ensures you and your coworkers are all up to date on the latest with that account. You just got off the phone with Leung—keep your record accurate by logging the call. View Leung Chan’s contact record. Before you head to your meeting, you might take a few minutes to find out the latest news about your account or the people who work there. You could do this by opening up a web browser and running multiple searches to find out what’s going on with Get Cloudy, or the technology industry, or by reviewing social network profiles for Alan and Leung, if you can find them. Your search might even show you what they’ve been doing on Twitter lately. 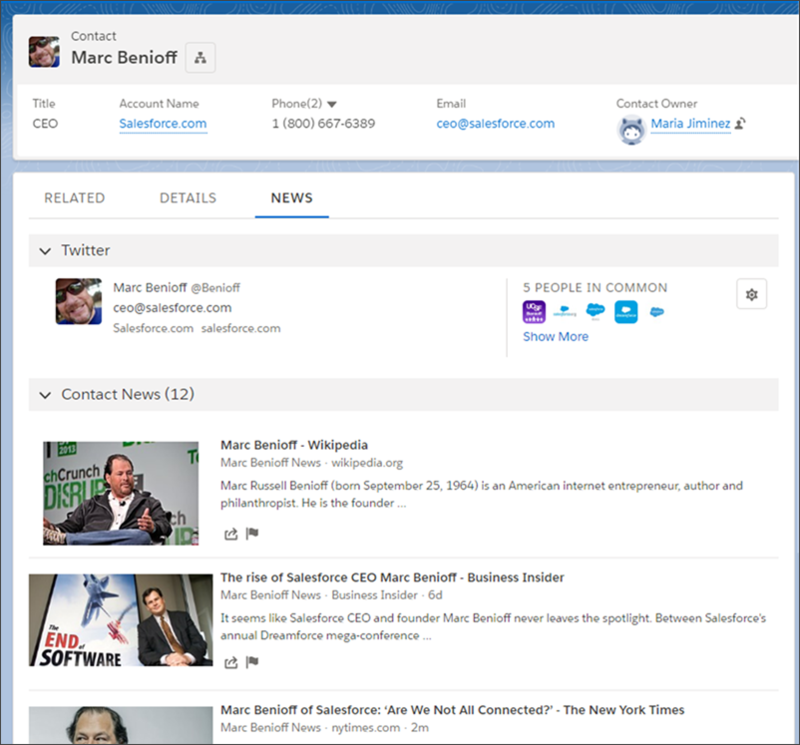 The News feature is just what it sounds like—news from US news sources, in English, available right in Salesforce. The news you see in Salesforce is customized depending on where you access it. If you view News on an account’s detail page, articles are based on the account, its executives, and industry. For contacts, news is selected based on the account the contact relates to. Before you can view News, your admin must enable it for your organization. If your org is using the News feature and the Social Accounts, Contacts, and Leads feature, you can see what your accounts, contacts, and leads are posting on Twitter. To see or follow a Twitter account from within Salesforce, you must have an account on Twitter, and you have to link the account or contact record to a Twitter profile. You can’t see anything about an account or contact that wouldn’t normally be available to you when you’re logged in to the social network. But you can see that information at a glance and you can use the Twitter profile image as the profile image for an account, contact, or lead in Salesforce. Know your company’s naming conventions for accounts. Using established naming conventions helps everyone in the company. Names not only help you find companies in your records, but they can be used to denote relationships between accounts and help you decide if a company or individual already exists in your records. For example, if you work with multiple franchises, you might need to use names that make sense in a hierarchy but also help you differentiate between two stores with the same name in a similar geographic area. Always associate contacts with an account. Contacts without accounts—private contacts—are like a forgotten boat adrift at sea. They’re hidden from all users except you and your system administrators, which makes them easy to forget, hard to find, and useless to colleagues. Don’t let inactive accounts and contacts get lost in the shuffle. Keep an eye out (or create a report to find) accounts and contacts without activities listed within the last 30, 60, or 90 days. Depending on your business, these inactive customers may be ripe for a new product, or it may be time to exclude them from list views, reports, and campaigns so you can focus on active customers. It’s hard to actively manage an account if it’s assigned to someone who isn’t using Salesforce. If you run across an account or contact that’s owned by someone who moved to a different position or left your company, help find the account and its contacts a new owner. Whenever you locate new information about an account, contact, or lead, enter it into Salesforce. Your Salesforce data is only as good as you make it.